1960's Grundig Transistor LW MW/AM SW FM Radio - Vintage 505 Made in Germany . Radio works however is a little crackly at times and I couldn't pick up any shortwave or long-wave stations. The station selection line isn't showing although the tuning knob does work. I'm not sure what size battery this would use if it had to. It does work on the Transformer shown although it's not in the greatest condition. Please see the photos for more details and thanks for your interest. Tunes into AM& FM channels. see all pictures for condition. Power cable is NOT included. Vintage RCA Victor Mid Century Shelf Radio Stereo Solid State Wood Cabinet. In good working condition. Top has a pop up handle. For Your Listening and Displaying Pleasure - Warranty! I HAVE SUPERSIZED THE PICTURES SO YOU CAN SEE EVERYTHING. DONT LET THIS ITEM SLIP BY. PANASONIC RF-2600 PORTABLE AM / FM / SW1 / SW2 / SW3 / SW4 SHORTWAVE BAND RADIO. Radio tested. All band works On power Ac. No tune in light. No strap. And anetana tip. Shipped with USPS Priority Mail. New ListingVintage Granco AM/FM Radio * WORKS GREAT! VINTAGE GE 7-2970 Ten Band Portable Radio Near Mint w/ Box. The box does show wear, but the radio looks to have hardly been used at all. It comes with its original tag and booklet. The radio plays FM but I couldn't get any shortwave channels, but I don't know what I am doing. The antenna measures about 3 1/2 feet long. This radio is in excellent condition. Works well with very nice sound. Has full antenna, and power cord. Good luck! Radio does work as it should and does tune in stations. Only one like it online for sale. Make it yours! 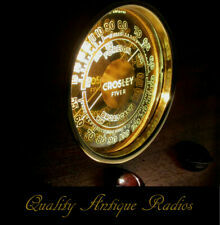 Short wave radio vintage. AOR reciever face plate was changed and direct connection. Radio functions but led display is slowly going out. We plugged it in and FM works. I looked up other radios like this and I think this is a short wave radio too, but I really do not know! the cord is in the back of the radio. Very nice Realistic Patrolman SW-60 multi-band radio! 117 volts. Olive Green. Great shape. Has been tested and works. (BELOW ) WE WILL WORK WITH YOU TO RESOLVE ANY ISSUES/CONCERNS AND CORRECT THEM THE BEST WAY POSSIBLE. CASH ONLY WHEN YOU PICK UP YOUR ITEM. Item specifics You might be able to find more specs for this item by researching online. The radio needs a little TLC but works and sounds great. The stations come in great. Please look at all pictures before bidding. No reserve. Thanks for looking and happy bidding! Beautful grey plastic five tube AM only radio. Dial light follows the pointer. Partial tube layout label in place. 13-1/2"W x 6"D x 6"H. Untested, parts only. 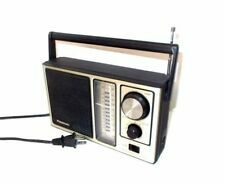 Up for bid is an Electro Brand #2971 AM/FM Shortwave Radio w/ Cassette/PB/CB/Air/Weather. It has been tested every thing works great on it and it sounds great. It is in very good condition. Panasonic Toot-a-loop AM Radio Model R-72, Works great! Here is a good working R-72 Panasonic Toot-A-Loop! One side of the radio is dented a little bit. A little paint wear. Available for pick up. I assure you I will work out any problems that you have. 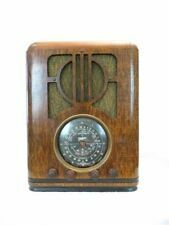 Up for bid is a 1925 Interstate Radio Co. 5 Tube Battery Radio Blandin Triple A Radio Cabinet. It is untested. It is complete with all the tubes. All the dials work properly. The cabinet has a couple of scuff marks but is in good condition. It measures 26 1/2" long, 8" tall, and 7 1/2" deep. Very nice sound quality and reception. So put us in your favorites. Tested and working. This radio is in amazing original condition. It does power up and all tubes light up, but it only hums. I am sure that it can be made into perfect working condition with minimal updating. 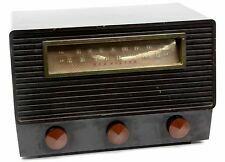 WHAT YOU ARE BUYING IS AN INCREDIBLE EARLY 1920s RCA GENERAL ELECTRIC RADIOLA MODEL 1 CRYSTAL RADIO RECEIVER MODEL ER-753-A . THIS RADIO IS IN AS FOUND CONDITION. THE RADIO HAS ITS ORIGINAL INSIDE THE LID FULL PAPER INSTRUCTION SHEET. See Pictures for Exact Item. The wood cabinet is in nice condition and appears to be the original finish. 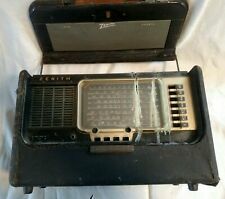 1960's AIRLINE ALL TRANSISTOR Radio MODEL GEN. 1703-A. color Turquoise Blue. Auctiva's FREE Counter. This very rare radio that would make a great addition to your collection! Decoration or display either way you will love this radio. The radio sounds like a 50 year old radio so don't expect Bosequality. the radio is model 2675. Vintage solid-state GE Stereo Star shelf unit. Everything is working perfectly. Very unique model. Clean overall. Some minor wear from aging. *Speakers NOT included. * All original equipment. Measurements are 16"Wx10"Dx4 5/8" tall. Will look fantastic in your home/office/business! Vintage 1970's Zenith Avocado Green AM/FM Radio C412F Works!